In the center - the relief image of St. George on horseback spearing a dragon. On the bottom right, underneath the front hoof of the horse - the letter М (Moscow) or С-П (St-Petersburg), indicating the mint of origin. Above on a circle from left to right - inscription, divided by the figure of St. George: "БАНК РОССИИ". Below the image of a snake - the year of issue. 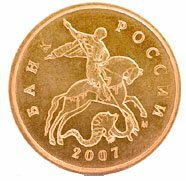 Since the second half of 2006, the Bank of Russia coin of 10 cents is made of steel, clad on both sides of an alloy of yellow copper (tombac). Material coin has ferromagnetic properties. 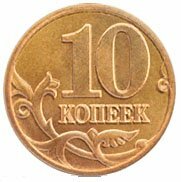 In the center (close to the right) - the denomination of the coin: the figure 10, beneath - the word "КОПЕЕК", arranged horizontally. In the lower part of the disc - the stylized vegetable ornament in the form of two branches.